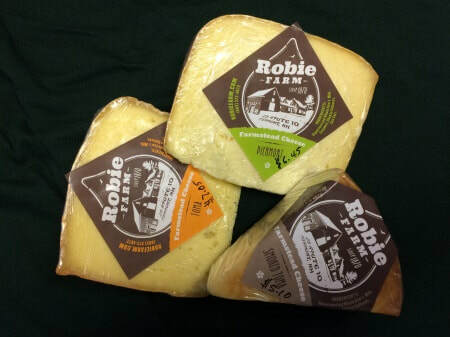 Robie Farm products are sold right here on the farm at our Farm Store. We are one of the few farm stores that sell raw milk in gallons and ½ gallons. You'll find a variety of meats: beef, veal, pork, pasture poultry, bacon, and sausage. We also carry free range/cage-free eggs, local honey and maple syrup. We always have on supply our own Farmstead cheeses. A minimum of $100.00 in purchases per Individual/Family on a monthly basis. Members receive a 10% discount on all purchases if the $100.00 minimum is achieved for the month. ​ love making new friends! We are a member of the Vermont Fresh Network, an organization dedicated to promoting local producers and business which believe in the security of our environment, our health and the support of the rural community. The store is closed on Christmas and Easter Sunday. Our products are also sold at a variety of retail stores and served at local restaurants. 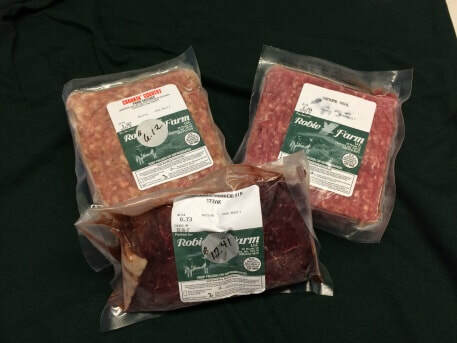 Custom Gift Baskets of Robie Farm products are available upon request. ​Please call for content and pricing information.